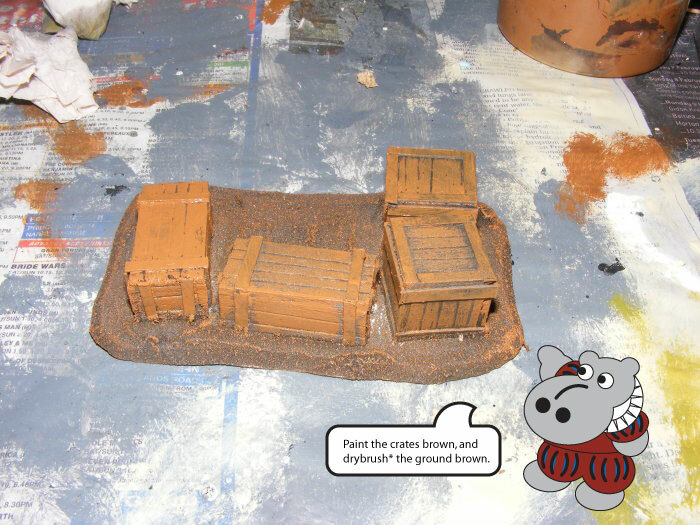 The Great Terrain For Hippos Auction! 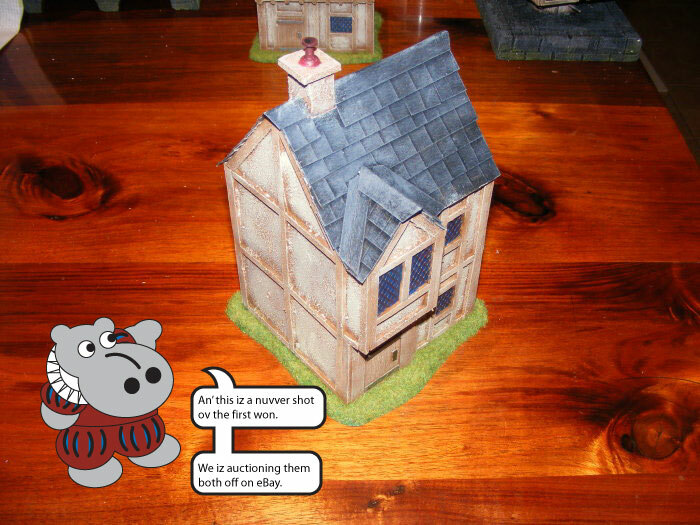 While you are waiting for Ishoo For (which would have been up tonight except for a minor 'art failure' or as Grot says 'Bugger up wiv the stoopid nerk wot does the pictures'), you can take a look at the Great Terrain For Hippos Auction! 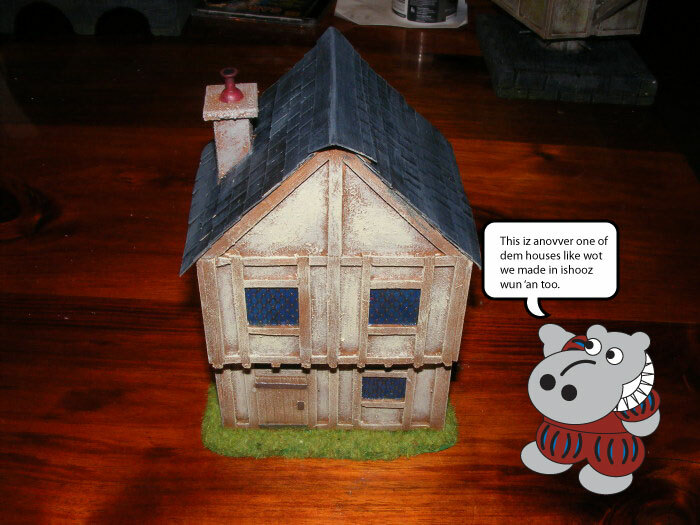 We're auctionig off the house from Ishoo Wun, along with a second house build using the same techniques! 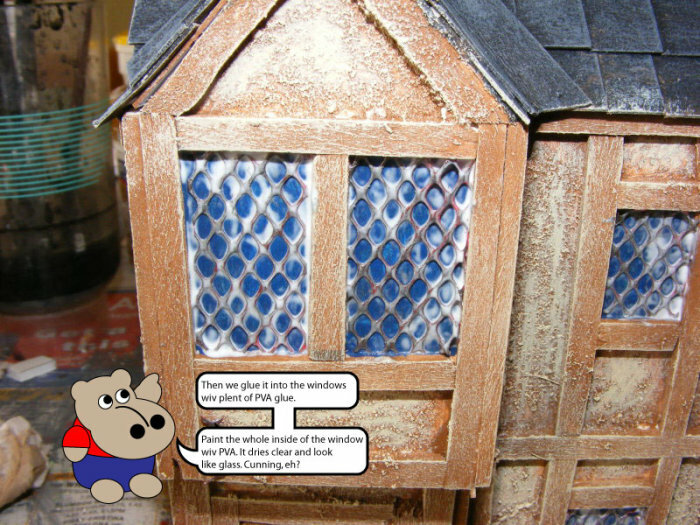 If you want in on the action, the auctions can be found here and here. 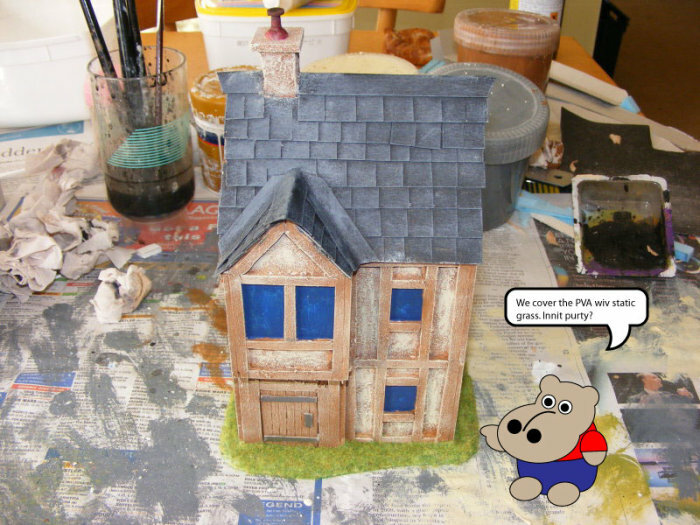 We anticipate having more of these auctions in future, so if at some future date (when future events such as these are effecting you in the future) you happen to see this, well, take heart, there's porbably something else available. 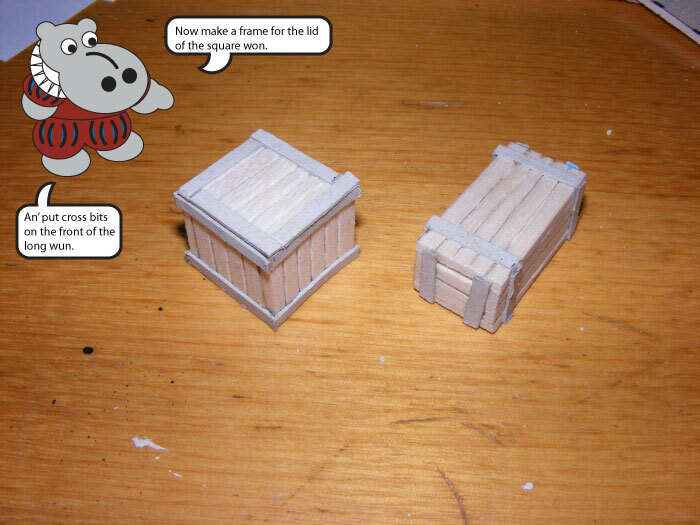 I should mention that porceeds of the auctions will be used to buy further terrain materials. 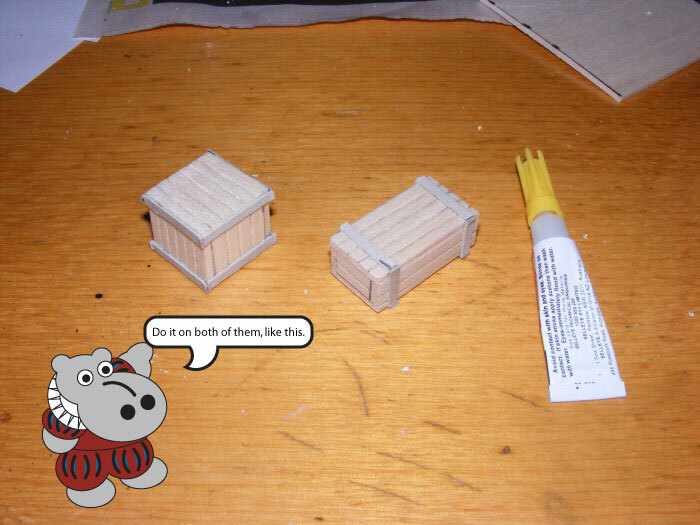 Here are some more crates built using the techniques (or, as Grot says; "Mefods") used in Ishoo Free. 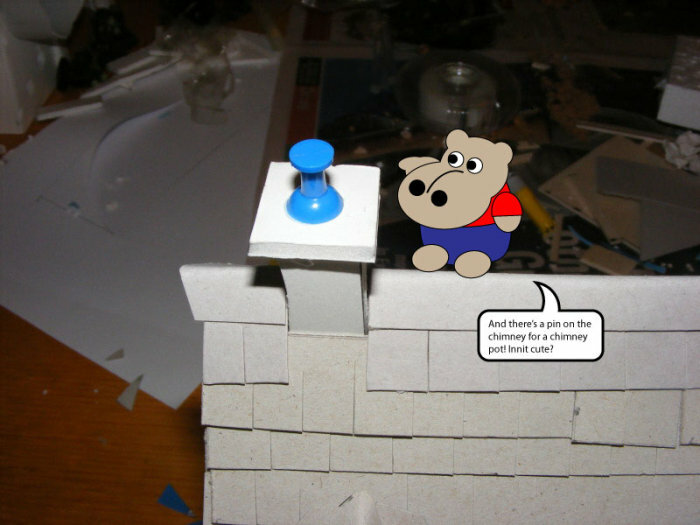 Why shood yoo use terrain? 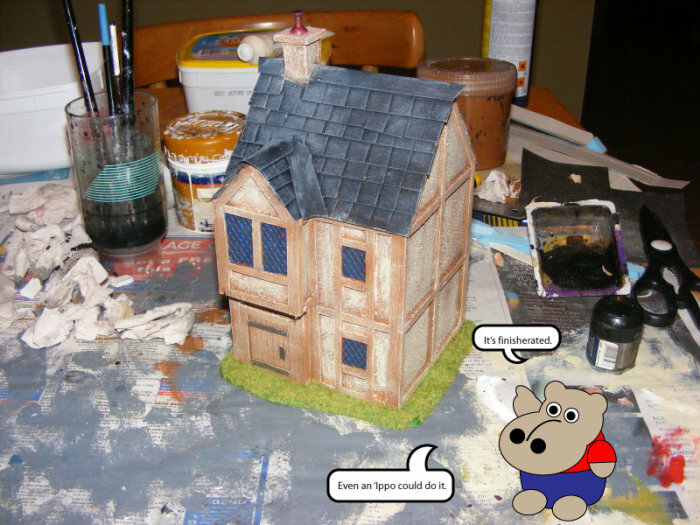 Why should you use terrain? 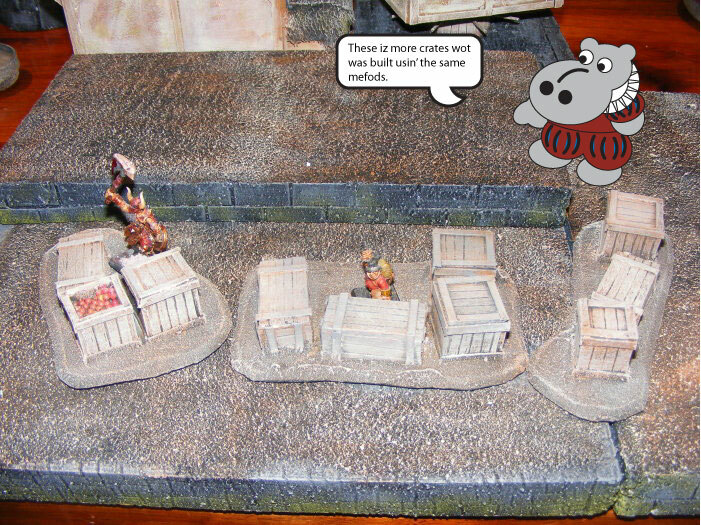 Well, I'll let Grot explain. 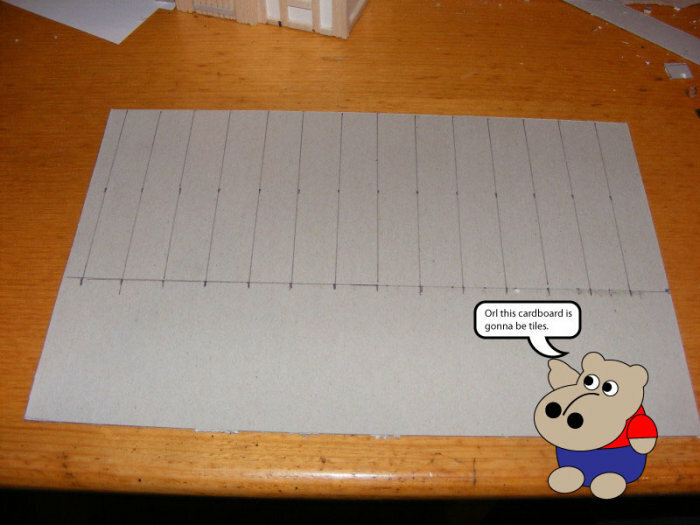 A lot of people seem to think making terrain is hard. 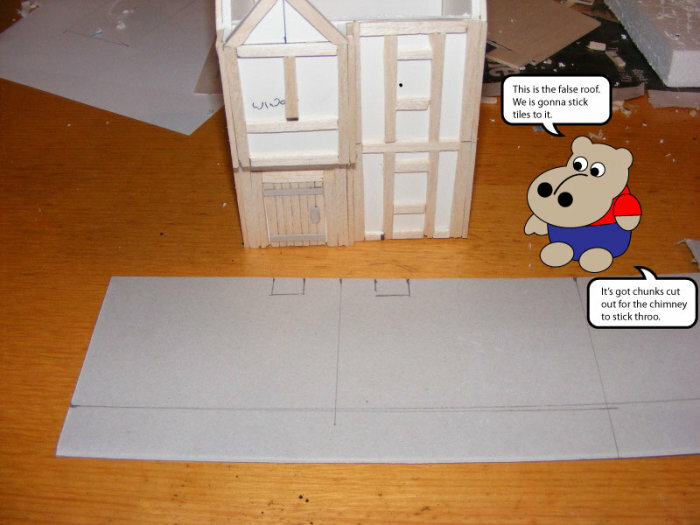 It's not. 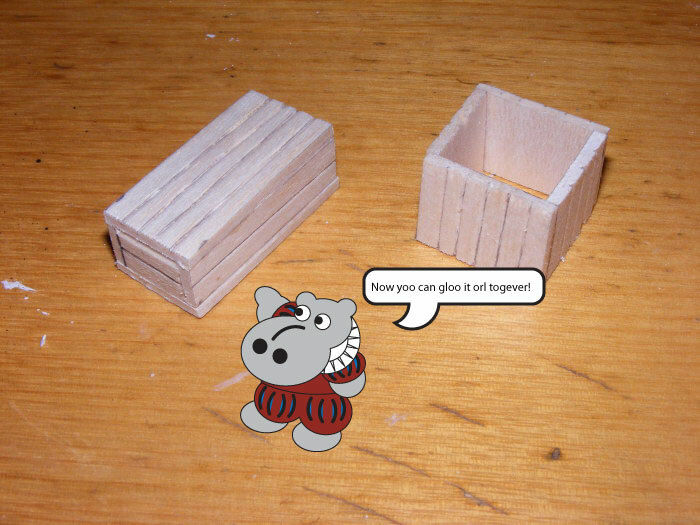 It's so easy, even a hippo could do it. 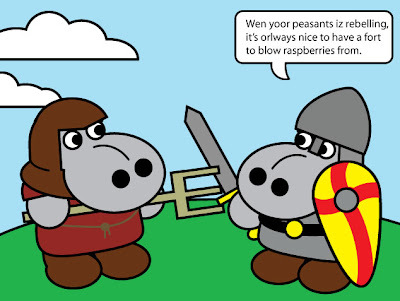 And to prove a hippo could do it, here's the latest installment of 'Terrain For Hippos!' 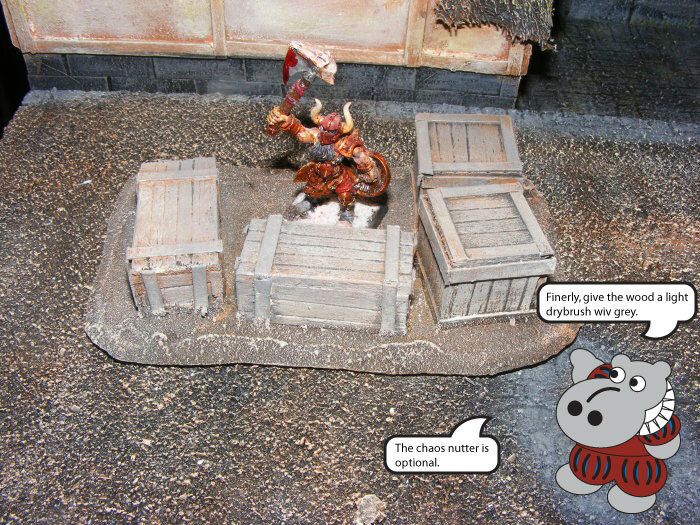 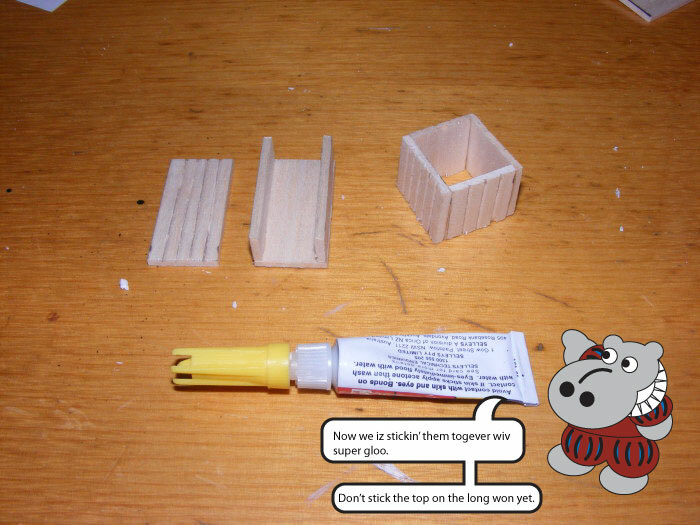 In this issue, Grot will be showing us how to build wooden crates to use as cover in skirmish games. 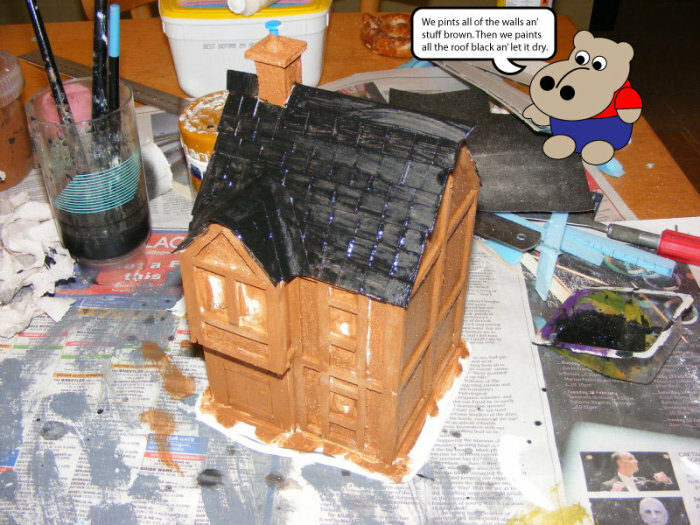 Take it away Grot! 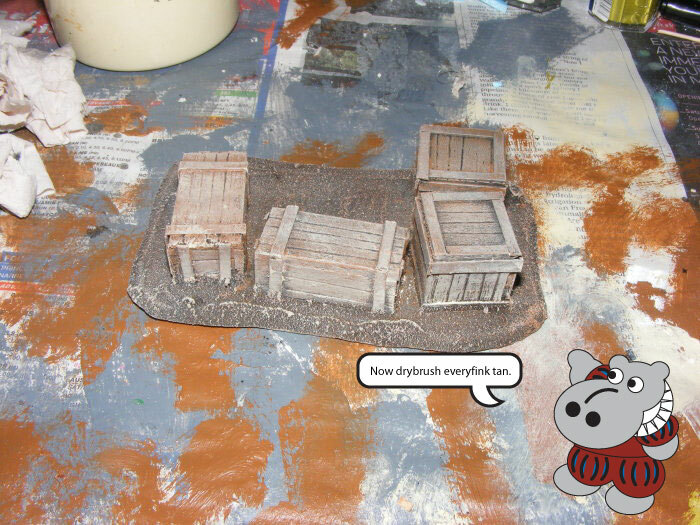 *Drybrush: A simple painting technique. 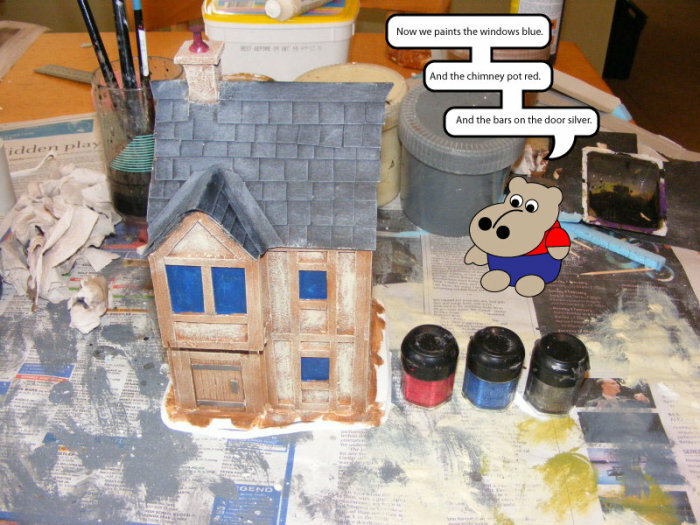 Dip your brush in the paint and wipe away most of the paint before lightly dragging the brush over the surface. 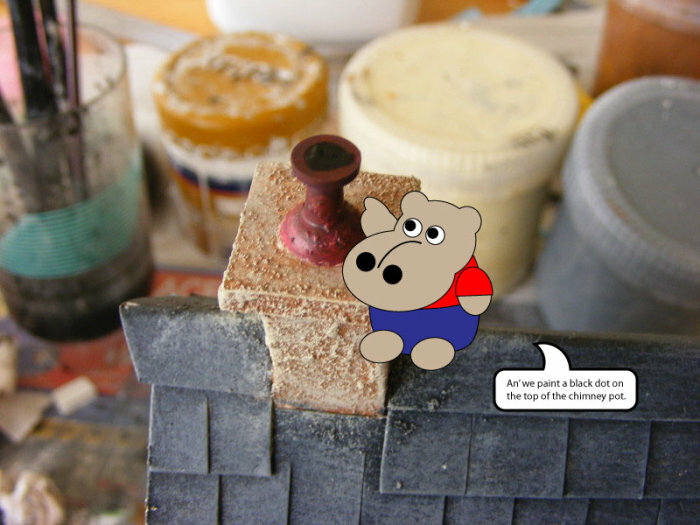 Only the highest parts of the surface will be painted. 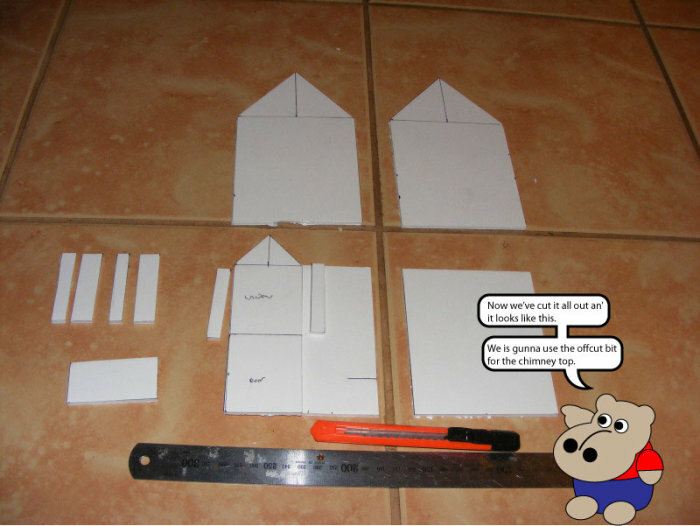 -The square box has side panels 2cmX2.5cm and 2cmX2cm. 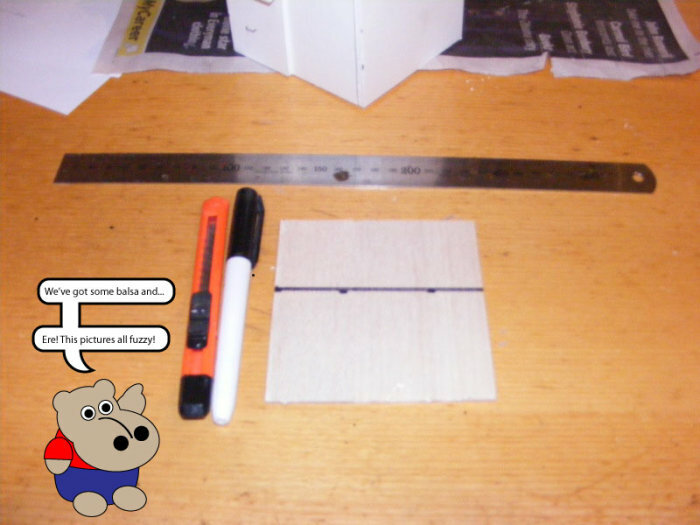 -The long box is 4cmX2cm, with 4cmX1cm sides. 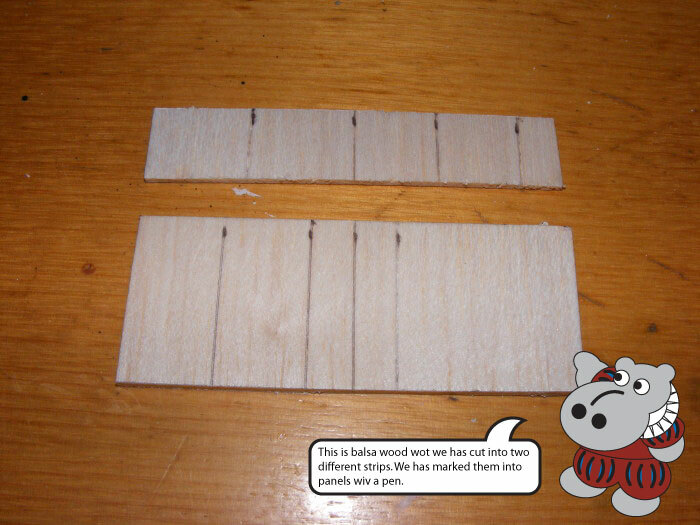 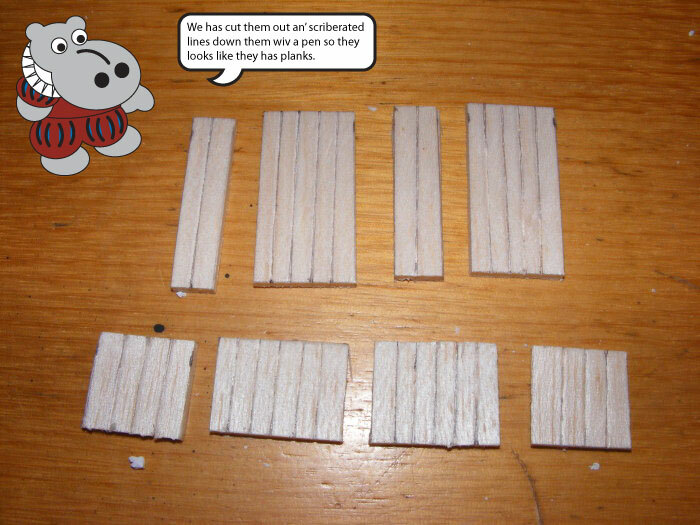 -The cardboard strips are about 4mm wide. 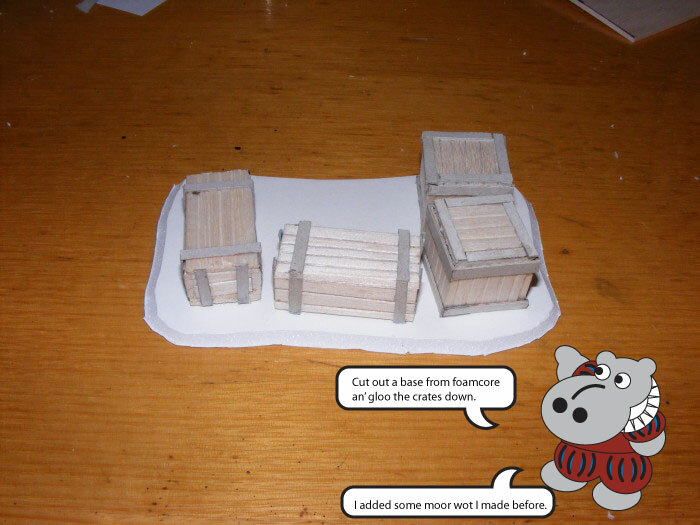 -About 10 minutes per crate to build. 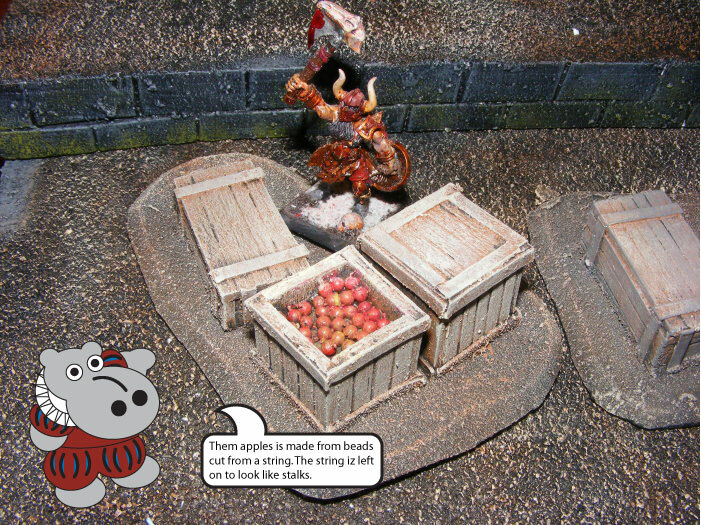 Grot Sez "Why not get orl your mates to help an' yoo can have lots an' lots an' lots of crates made in an evening!" 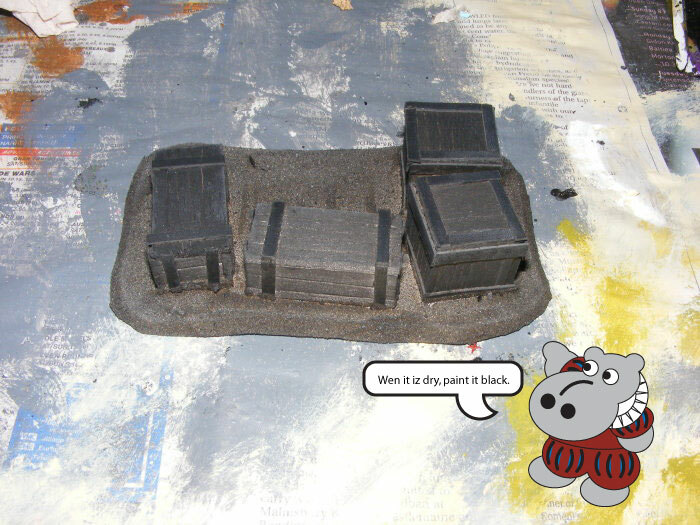 -About five minutes to paint, plus drying time. 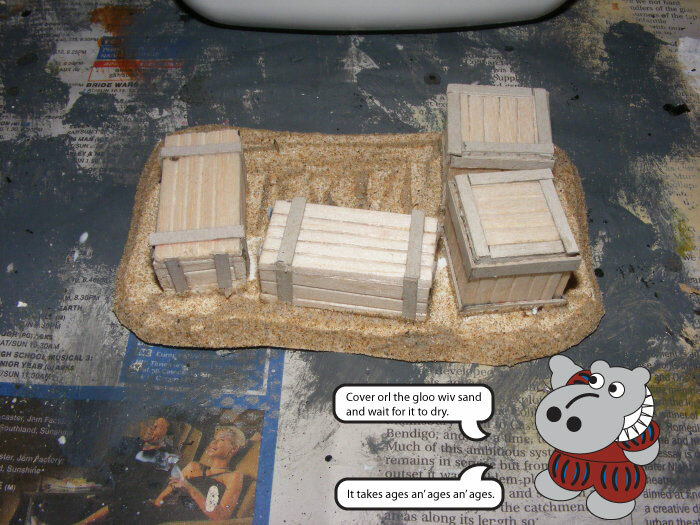 A lot of people seem to think making terrain is hard. 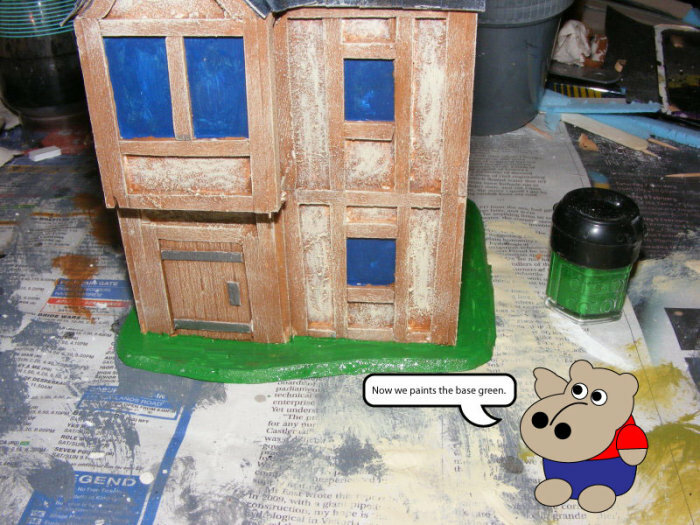 It's not. 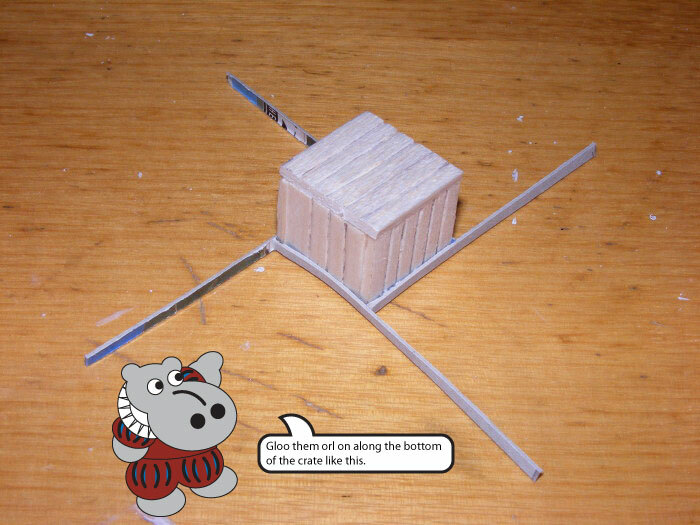 It's so easy, even a hippo could do it. 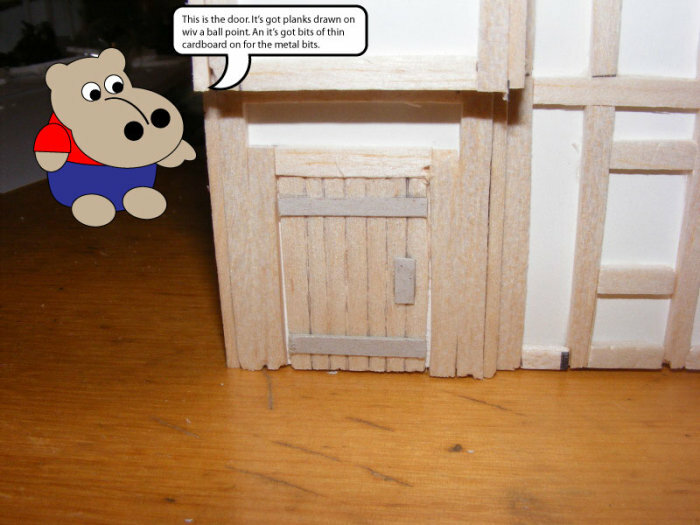 And to prove a hippo could do it, here's the latest installment of 'Terrain For Hippos', a new, visual step by step terrain building guide, hosted by professional Hippo, Grot Bag. 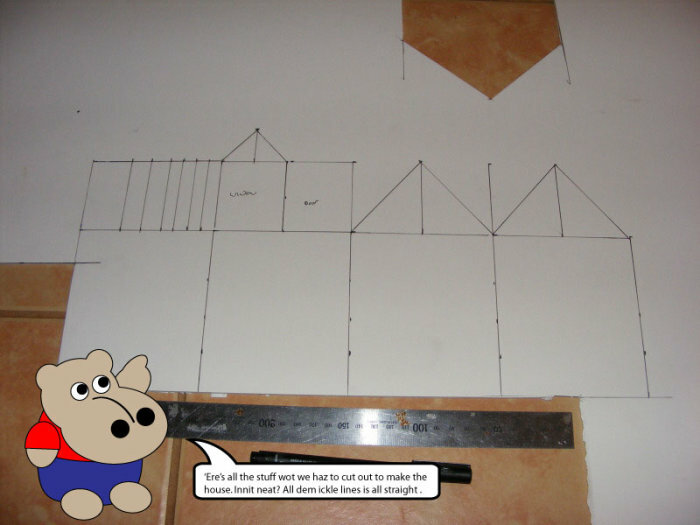 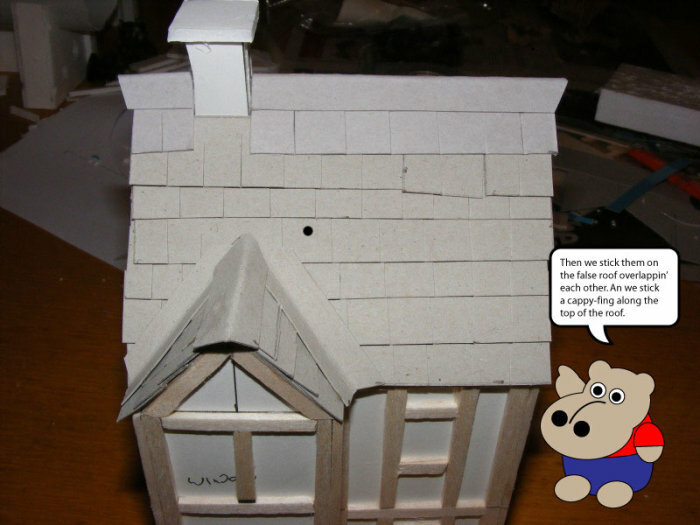 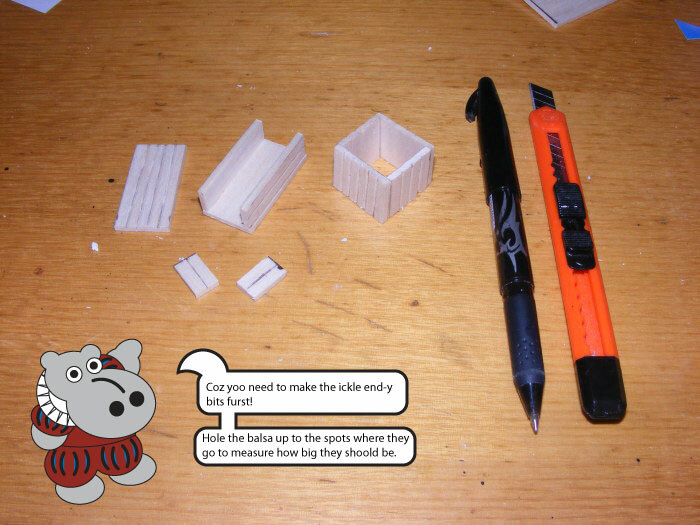 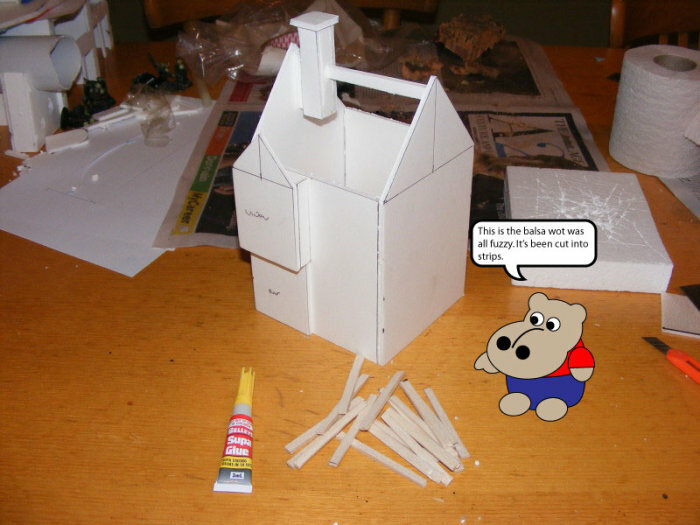 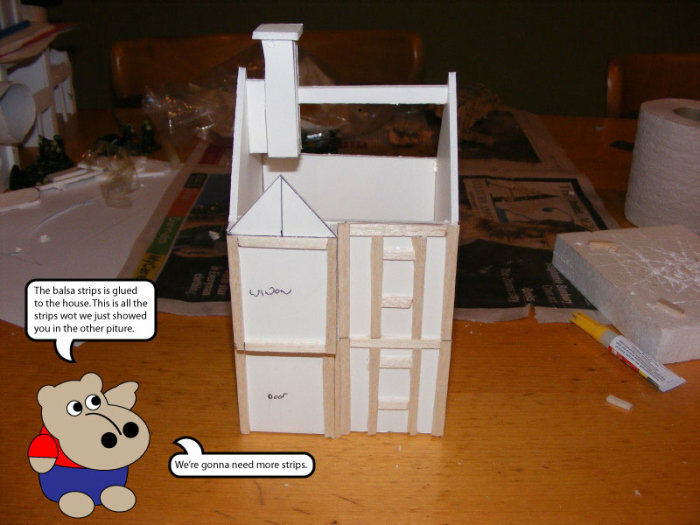 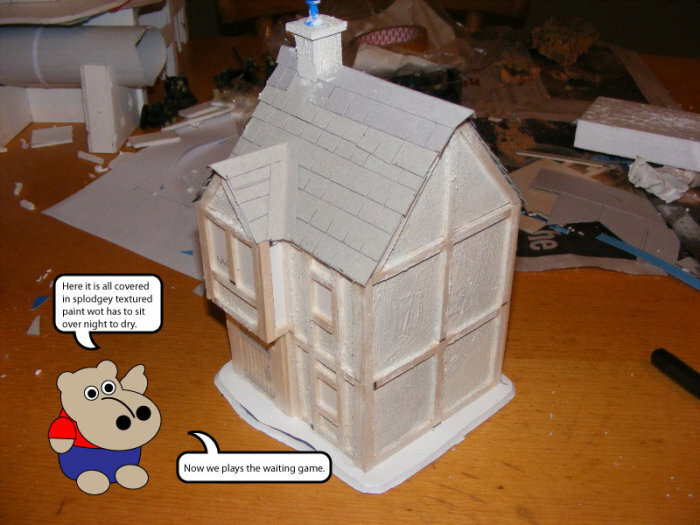 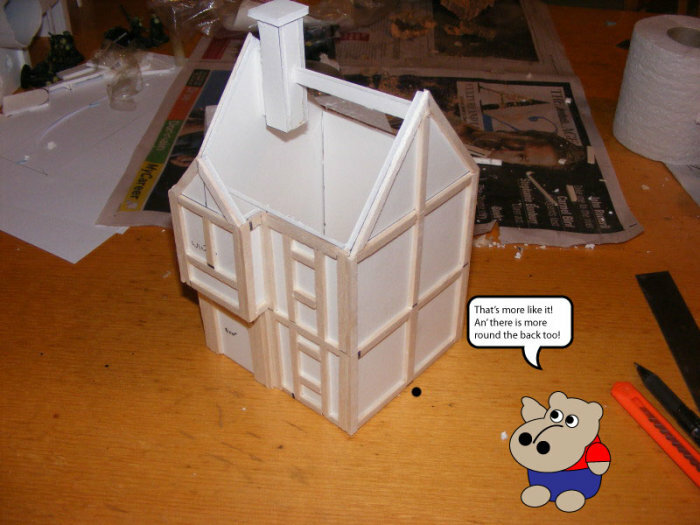 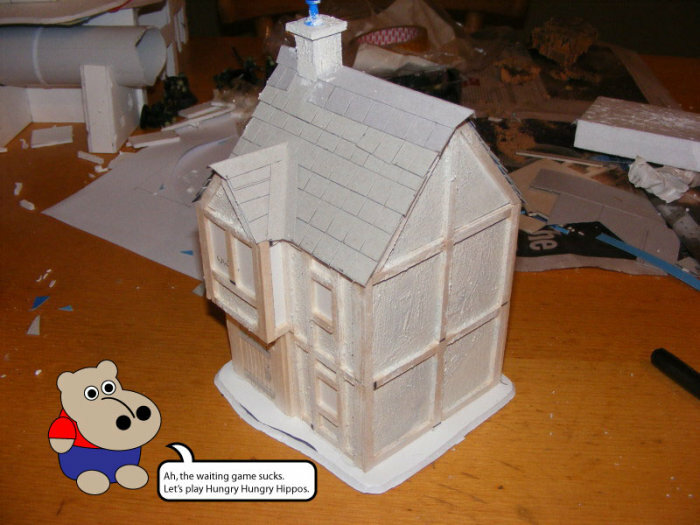 In this issue, Grot will be showing us how to finish off and paint the 28mm scale timber frame house from issue one. 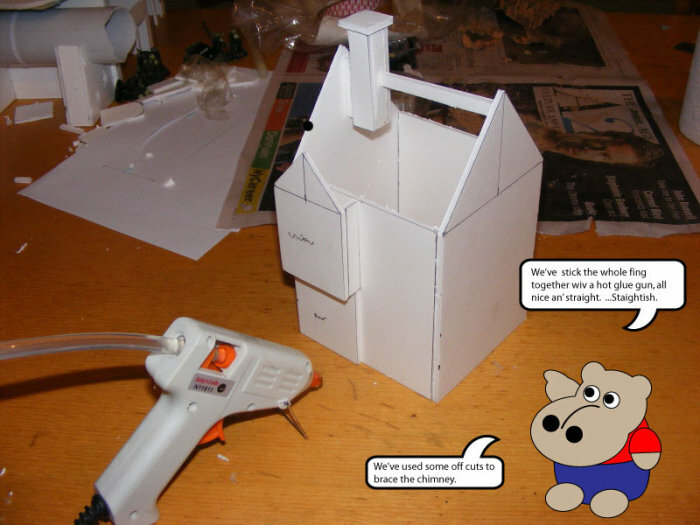 Take it away Grot! 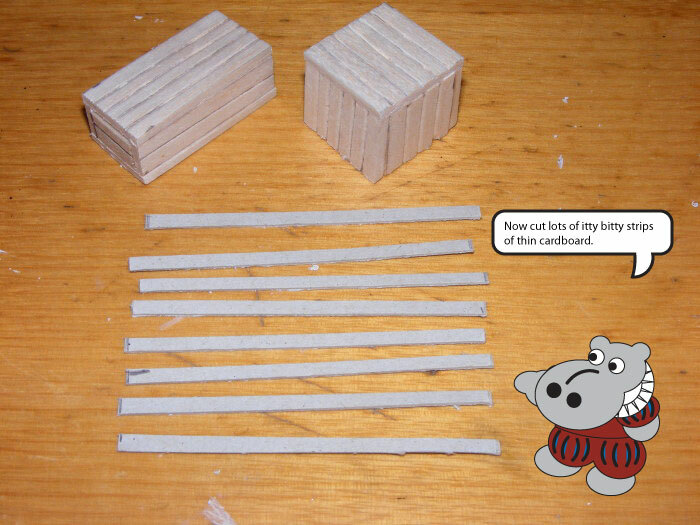 Approximately two hours to build. 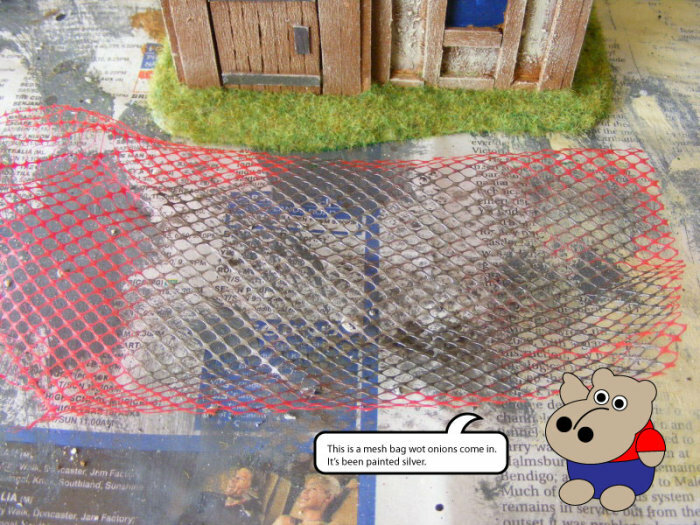 Approximately half and hour to paint and flock, plus drying time. 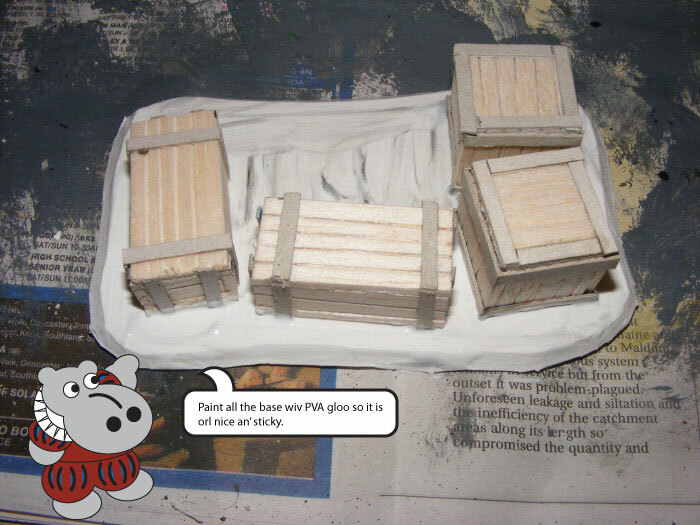 More thrills, spills and sage advice next issue when Grot explains how to make packing crates! 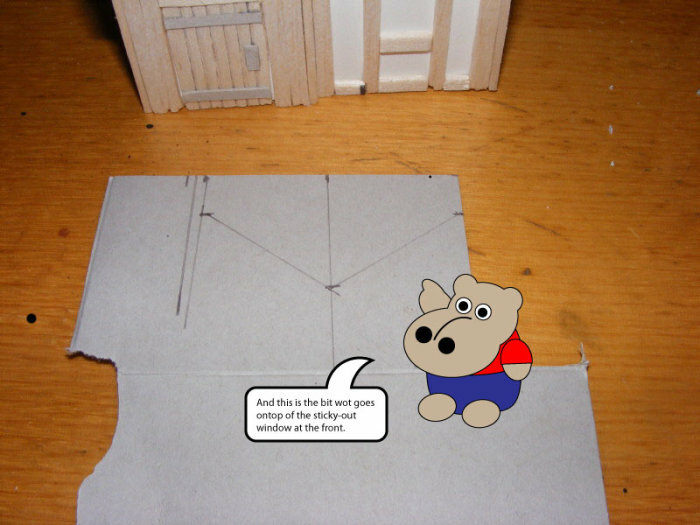 And don't forget to vote for what you want to see in Ishoo For! 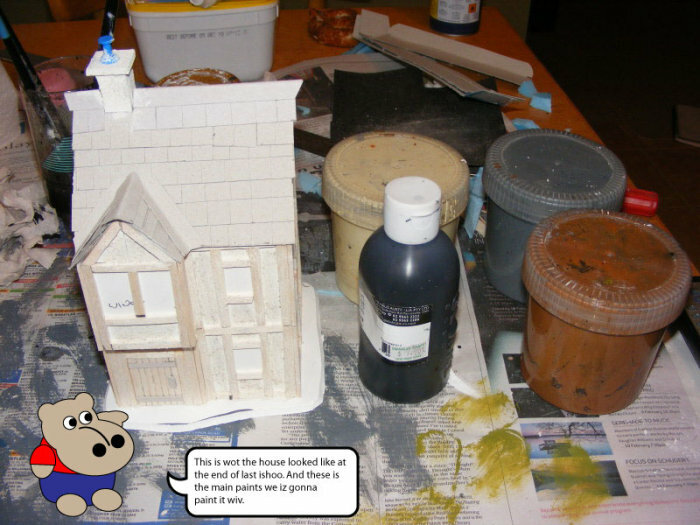 A lot of people seem to think making terrain is hard. 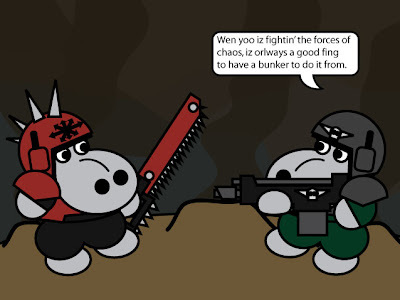 It's not. 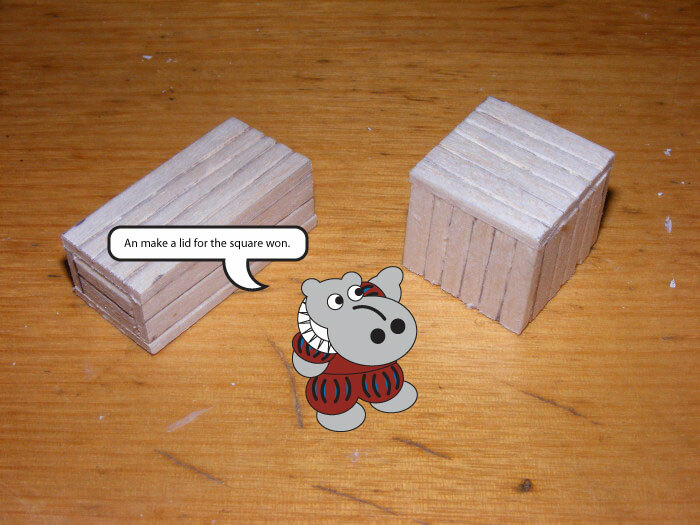 It's so easy, even a hippo could do it. 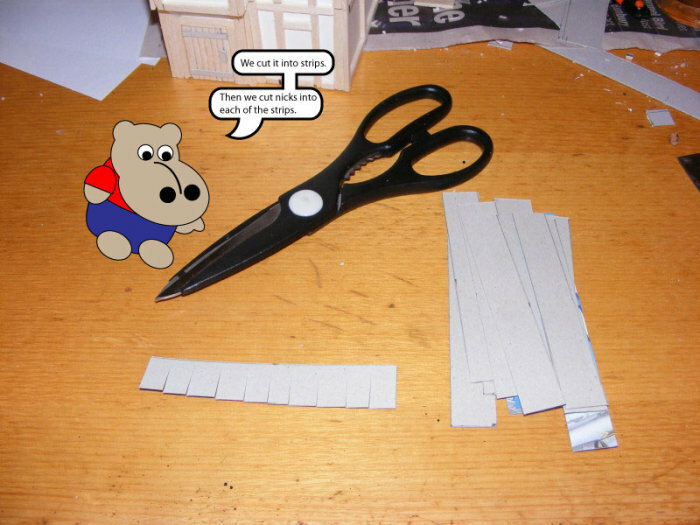 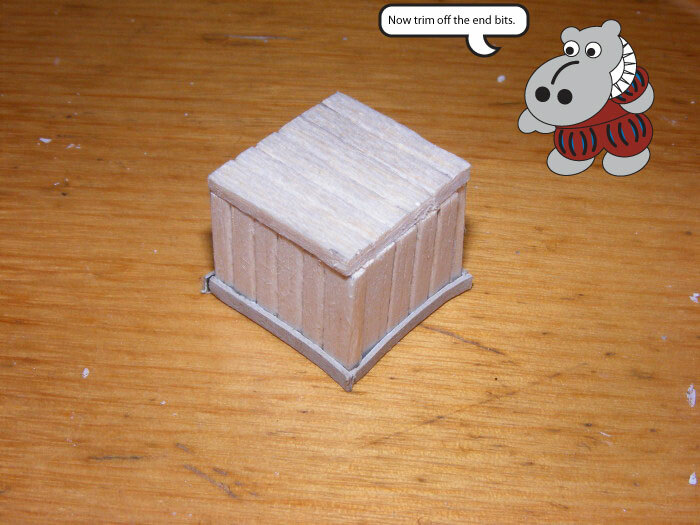 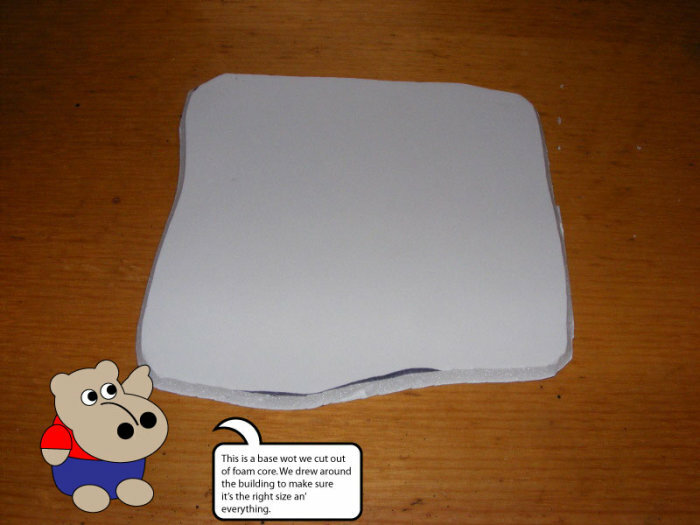 And to prove a hippo could do it, here's the first part of 'Terrain For Hippos', a new, visual step by step terrain building guide, hosted by professional Hippo, Grot Bag. 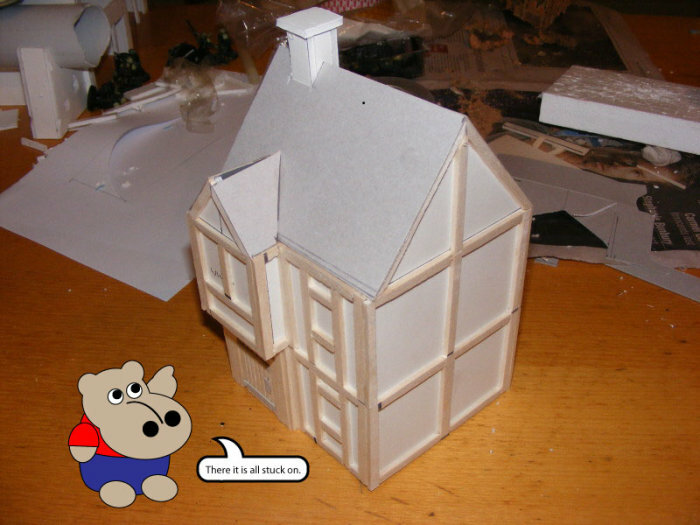 In this issue, Grot will show you how to build a simple two-story timber frame house, perfect for a medieval or fantasy game in 28mm. 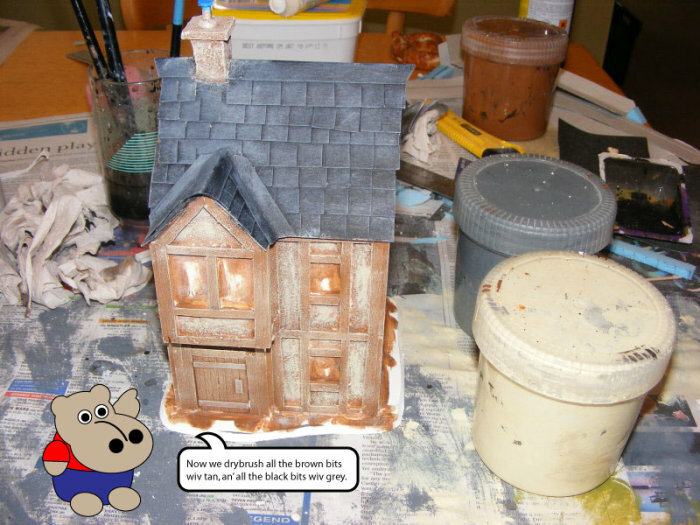 Take it away Grot! 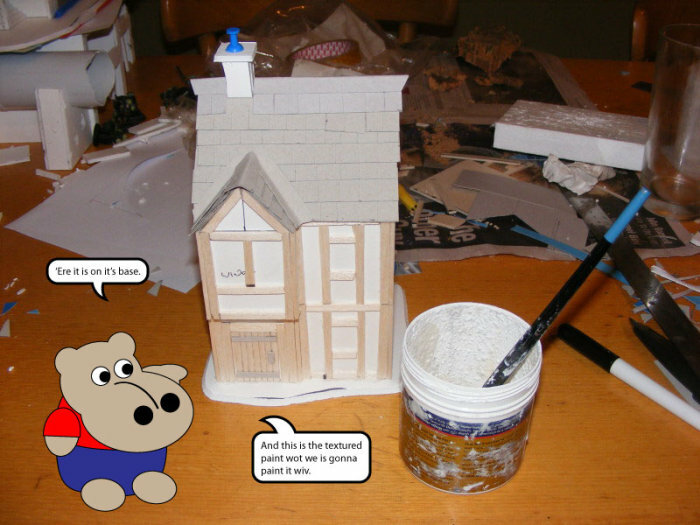 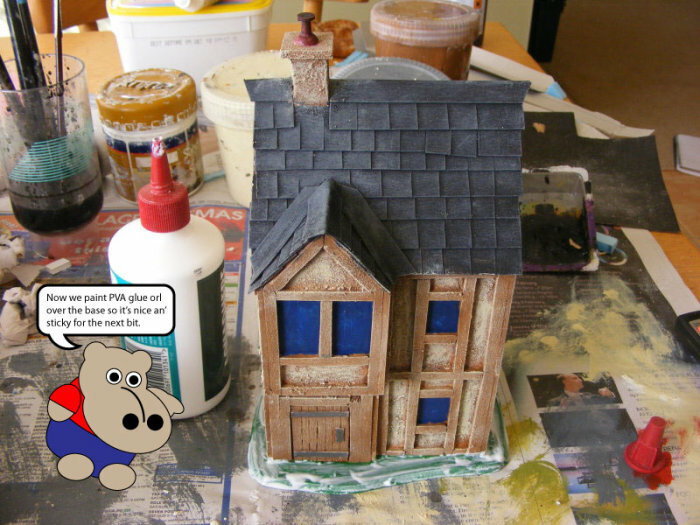 Grot will be back in Ishoo Too to show you how to paint and finish the house.